The Baltimore Folk Fest was started in 2012 by Baltimore musician Alex Champagne as a product of his passion for folk music and the community that surrounds it. The Folk Fest sets itself apart from similar festivals by specifically highlighting local artists from the Baltimore music community. 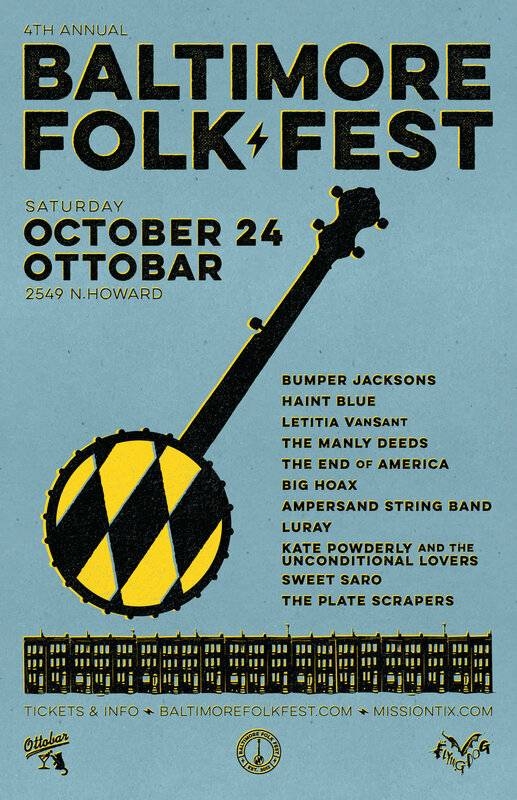 I was tapped to update the Baltimore Folk Fest’s visual identity for its fourth year. My first tasks were to re-draw their iconic ‘Maryland state flag banjo’ logo to improve its visual balance, and to select a new typeface — Lulo — to be used throughout the brand. Alex was looking for an aesthetic that would speak to both the rustic vibe of folk music and the urban grit of the festival's home city, so I added an illustration of Baltimore row homes to the visual arsenal and brought in texture and offset colors that would pay homage to mis-registered silkscreen and letterpress prints.